This 45 minute stage show has stood the test of time, being a firm family favourite with audiences around the world. Cruising from Miami, appearing at Butlins, Haven, Pontins, Brend Hotels and countless schools across the country. 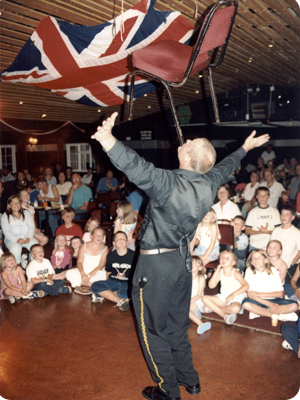 This comedy juggling show is a surefire family favourite comprising: Juggling, Comedy, Magic, Balance and Merlin's huge presence. Click here to view testimonals.